Nielsen Bainbridge Acid Free White Foam Board 32x40x1/8 - 25 Sheets per box. 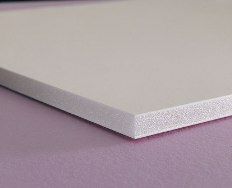 Bainbridge Acid-Free Foam Board features a pure white surface paper providing a clean and crisp base for mounting. Thicker surface paper eliminates show through from foam core. Toothier surface paper provides a stronger grip for adhesive. Foam Board is 32x40 and available in 3/16" or 1/8" thick. Sold in cases of 25 sheets and shipped in a double walled thick corrugated box for added protection against shipping damages.